Cole McGrath is dead. And he's staying that way. The developers who created him say that the high-voltage superhero who starred in the first two Infamous games won't be back in any way, shape or form in the series’ next installment. Goodbye, Electric Jesus. You were the best superhero ever to zap your way through a video game. In superhero comics and the entertainments inspired by them, the afterlife has a revolving door. No one who dies ever stays buried for very long and you can pretty much predict when they're coming back. But it's going to be different for Cole McGrath. He won’t be rising from the grave. I liked Cole. A whole lot. One of the key gimmicks of the Infamous series is that the powers and plot points doled out by the games change depending on how you play. So, much of that good feeling for Cole was my own doing. Infamous 1 & 2 let me feel like I was in charge of a superhero's evolution, giving me the option to make him a disturbingly vicious anti-hero or a goody-two-shoes savior. With me, it was always the latter. Look: when you have superpowers, it's ALWAYS cool to save people. That random life hanging in the balance, staring down at a speeding train or buried under rubble? There's no better feeling than when you can save it. It's a rush that the two PS3 games delivered again and again. Sure, there were always street gangs and giant crawfish to fight. But, man, Sucker Punch's unique recipe for the Infamous series made life-saving feel great, like something way more significant than grinding XP. Maybe it was the gratitude expressed after you healed someone at death's door or the way that passers-by would take your picture after you drove the bad guys off an intersection. Whatever it was, you really felt like a whole city was appreciative of your efforts. Just so much AI programming trickery? Maybe. But it was trickery I was eager to be fooled by. Fox: "We think that feeling like your superpowers have weight and can really affect the world is what players want. Not to feel like you’re a cartoon hero in a cartoon world." A while back I wrote a piece comparing the lead characters of the first Infamous and Prototype games. They both featured super-powered characters in sprawling open-world cities but only one let you be a Tesla-descended messiah. That made all the difference to me. So, I felt genuine twinge of sadness when I reached the good ending of Infamous 2 and watched Cole sacrifice himself to prevent a plague of more superpowered beings from sprouting all over the world. "But, of course, he'll be back," I told myself. When the upcoming Infamous: Second Son was unveiled for the PS4 in February, it seemed like Cole would be back in the new game somehow. Probably as a godlike supervillain, I thought. That's just the way these things work, right? Not this time. I reached out to Second Son's developers to make sure any eulogies written for Cole wouldn't eventually have to be revoked. Speaking on the phone with creative director Nate Fox and co-founder Brian Fleming, the pair said that there's no chance Cole's coming back. Earlier this year, I asked Fox about which Infamous ending figures into the timeline leading up to Second Son. He really couldn't answer me then. But, last week he told me that it's the good ending—with Cole surrendering his life for the greater good—that’s now official Infamous continuity. They may not have been real, but I’ll miss the places Cole electro-skated, through, too. Influenced by the societal carnage wreaked by Hurricane Katrina, Sucker Punch crafted two different but equally great open-world cities. Empire City was a bustling, reactive homage to New York City, struggling to survive. New Marais was soulful and funky, throwing everything from creepy swamp monsters to Anne Rice-style vampires at you. Electricity is the lifeblood of the modern age, used to kill or cure with the right application. In both burgs, players revived or restored the power grid to establish a benevolent or draconian order. The powers and how you used them created a symbiotic relationship to the character and the cities. Fox: "In a game about choices with consequences, why not have the whole franchise move along with what players think is right?" Honestly, I don’t know enough yet about Delsin to know if I’ll like him. His powerset doesn’t seem like it’s going to be conducive to letting me get my Jesus on. Fox told me that players will still get to make choices on how they develop abilities by how they play. So, maybe the messiah craving I have will get fulfilled by, I don’t know, improving air quality or something. 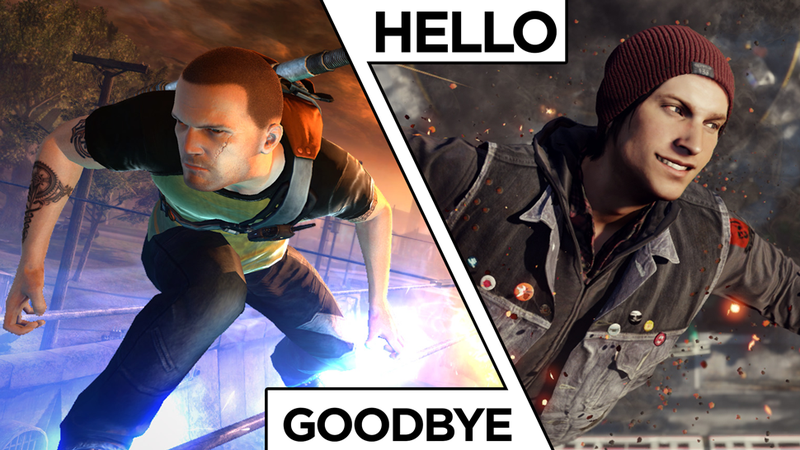 Nevertheless, Delsin’s journey has yet to start. But I’ll always remember the guy who came before him, a guy who let me bring entire cities back to life. Cole McGrath was the best superhero video games have ever produced. May he rest in peace.